Coastal Maine plein air in watercolor and mixed media. Amy Hosa hails from San Francisco. She is a retired illustrator and graphic designer, and was also the exhibit designer for the Maritime Museum at San Francisco Maritime National Historical Park for 14 years. Her fine art watercolors have been in gallery shows, and she is a member of the California Watercolor Association (www.amyhosa.com). Amy’s love of things maritime took hold over 30 years ago when she volunteered in the Boat Shop on Hyde Street Pier to restore old boats and learned to sail on them across San Francisco Bay and into the Delta. Her partner’s current project is a 30’ Angelman ketch (a real fixer-upper) that now has new rigging and sails. Note: This is a five-day course ending Friday evening. All levels of experience are welcome. 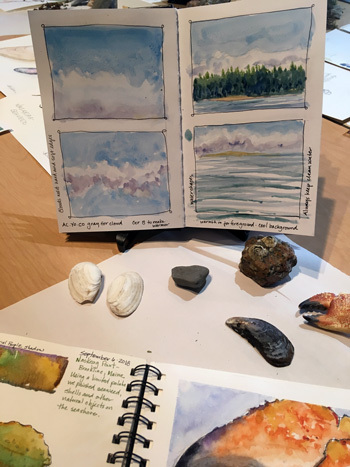 Join artist and instructor Amy Hosa in creating colorful compositions that capture the essence of Maine’s rocky coast and details of life along the shore. Each day we’ll travel to new locations—boatyards, harbors, lobster wharves, quaint towns, islands, fields of wildflowers, granite ledges, and more. 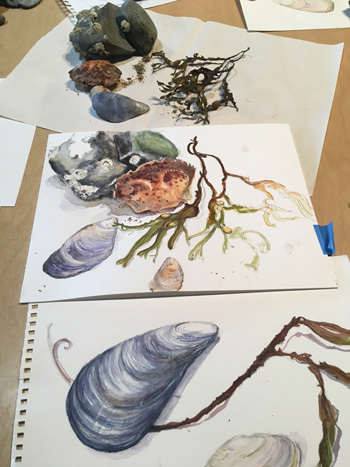 Experiment with a variety of mixed-media techniques perfect for plein air: pen and pencil, watercolor, charcoal, and pastels. You’ll develop color studies on location and also have time back in our “loft studio” to complete finished pieces using the media of choice.